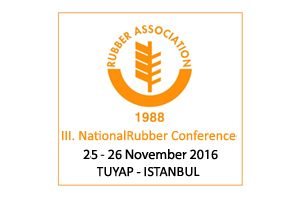 The 3rd Rubber Conference (with international participation) organized by the Rubber Association of Turkey will be held in “The Istanbul, TUYAP Fair Convention and Congress Center “on November 25th and 26th, 2016 concurrently the Istanbul 9th Rubber Industry Fair. The conference is expected to bring rubber producers, manufacturer of rubber products, researchers from rubber industry and institutions, delegates from the relevant associations together to discuss the recent scientific developments and technical trends on the wide range of themes such as rubber components and materials, rubber processing, physical properties of rubber products, innovative applications, safety and legislation. We are inviting you to Istanbul; a magnificent city embraces two continents, one arm reaching out to Asia and the other to Europe, the cultural capital of Turkey and the inheritor of various civilizations since ancient times, for the 3rd Rubber Conference. • Abdalla Mbaruk ABDALLA- Industrial Eng. • Kadri YAĞAN- Chemical Eng.